Oscar is looking great 2 ½ weeks after his surgery. I was ecstatic to see him recover so well after surgery. 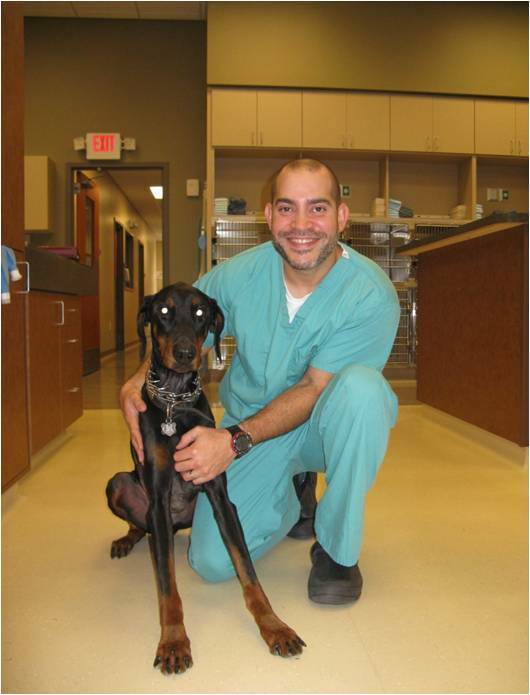 Oscar, a 3 year old male Doberman Pinscher, was running in the back yard with the owners when suddenly he jumped on pile of wooden sticks. The owners were surprised and horrified to see a large wooden stick coming out of the right chest wall when he jumped out of the pile. The stick was sticking out of his right chest wall and for a small period of time Oscar was suspended in the air only supported by the stick when the stick broke. Oscar kept walking and shaking, when part of the stick that remained in his chest wall fell on the ground. Immediately after the incident he became painful, lethargic and was reluctant to walk. Oscar presented to our Emergency Service with a skin wound on the right side of the chest wall that had a small amount of blood, increased respiratory effort, but no signs of a foreign body. Radiographs (x-rays) of the chest revealed evidence of pneumothorax (medical word for pneumo =air; thorax= chest cavity; free air in the chest). Pneumothorax is evidence of communication of the chest cavity with the outside world or worse injury to the lungs. Dr. Duran set in motion the treatment plan, which included stabilization with intravenous fluids, pain medications and thoracocentesis (removal of the air in the chest cavity). The thoracocentesis yielded close to 1 Liter of air. We thought that we had removed all of the air in the chest. However, radiographs showed that air continued to enter the chest. After thorough evaluation, a surgical exploratory of the 1.5 cm skin wound and the chest was recommended to determine if there was any internal damage. During exploration of the chest there was evidence of a 1.5 cm defect in the intercostal muscles (muscles between the ribs). That defect was extended and a thoracotomy ( incision in between the ribs to access the thoracic cavity) was performed. The lungs did not show any evidence of damage due to trauma, but a 1cm defect was noted on the diaphragm. The defect on the diaphragm was extended and a limited abdominal explore was performed. To my surprise, the liver had no evidence of trauma, but I retrieved 2 wood splinters from the abdomen. This was evidence that the wooden stick that impaled the thorax continued into the abdomen and there may be more foreign bodies present in the abdomen. The limited abdominal explore continued, and to my surprise there was a large wooden stick palpable in the mid abdomen. At that point the decision was made to explore the abdomen thoroughly. The defect on the diaphragm was repaired as well as the skin wound. A chest tube was placed to help evacuate the air off the chest after surgery. The large wooden stick went through the right side of the thorax, diaphragm and was found in the back musculature next to the aorta during abdominal surgery. 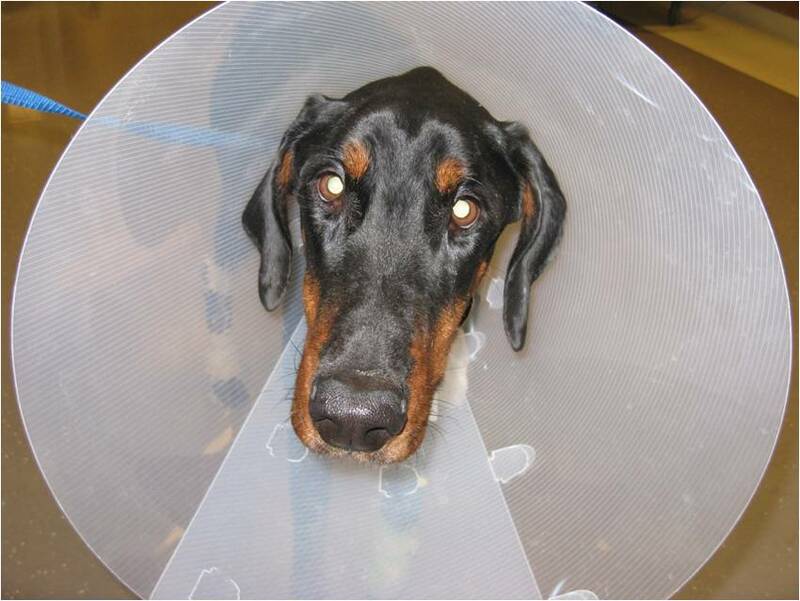 Oscar goes home after surgery with an Elizabethan collar to prevent him from licking the skin incisions. An abdominal exploratory was performed to determine which organs were damaged during the wooden stick’s pathway and it’s final destination in the abdominal cavity. Unbeknownst to me this would soon become one of the most interesting and emotionally rewarding surgeries of my career. The abdominal explore revealed that a wooden stick approximately 8 cm was lodged in the hypaxial musculature ( back muscles ) between the aorta and the caudal vena cava displacing the aorta. There was also evidence of a hematoma (collected blood outside a vessel) in the region of the left kidney). During palpation of the affected area, there was palpable blood flow turbulence on the segment of the aorta next to the entry site of the stick. A potential tear on the aorta was suspected at that site. In order to prevent acute bleeding when removing the stick, the segment of the aorta was isolated and temporarily occluded with one temporary Rummel tourniquet in front and one behind the stick. The stick was isolated and removed from the muscle. The Rummel tourniquets were gradually loosened resulting in hemorrhage from the isolated segment, so tourniquets were tightened again. Upon close examination, a 0.3 cm tear was visualized and sutured. The Rummel tourniquets were loosened to determine if the repair was successful and there was no evidence of hemorrhage. We were surprised not to see any major evidence of damage in the rest of the abdominal organs. The abdomen was closed and Oscar successfully recovered from surgery and anesthesia. Oscar remained hospitalized for 3 days for intravenous supportive care, antibiotics and some TLC. We were all amazed on how well he recovered from an event that could have ended his life! The penetrating stick stopped millimeters away from a life threatening aortic penetration. I can’t describe how extremely proud we were to see him walk home 3 days after his near death experience. Thank you Oscar for being a fighter and reminding us why we chose to do this for a living. We are so glad to see you go back home to your family.